About 80% of the population demonstrates some degree of postural (hips, back, neck) disorder. An active lifestyle is the key to health and happiness at any age. When injury or accidents happen causing pain that limits your activities, your lifestyle can change dramatically. Posture Pit-StopTM aims to help you to identify and prevent harmful postural habits that are the cause of stress and pain so that you achieve optimal physical mobility and performance, so enabling you to enjoy life. I combine traditional methods of Alexander Technique with video and stills photography with force plate measurements to accurately study your body’s motion and muscle action. Using this I can create a detailed evaluation of your particular patterns of movement. 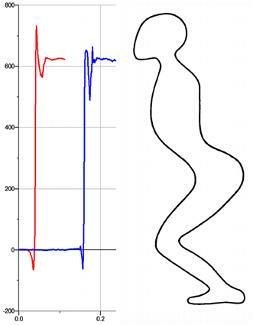 The graph shows that the feet, instead of increasing contact, actually lose contact with the ground due to excessive tension at the hip joints and legs. The subject then typically places their hands on their thighs to force the legs down and the primary co-ordination of the head, neck and back is lost producing strain on the back. 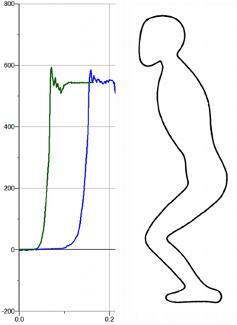 Here the graph shows appropriate muscular use in sitting with the feet gradually increasing contact with the ground. There is an appropriate amount of force used to stand and the primary co-ordination of the head, neck and back is retained.